In a monochrome ("black and white") image, each pixel is recorded as a number which corresponds to how "bright" it is. A value of zero means that pixel is black and the maximum value means it is white. The numbers in between represent the different shades of grey. In reality, the human eye cannot distinguish more than 16.7 different million colours. Images with more colour combinations than this will usually be converted by your computer's graphics card to compress the colours in to a much smaller range that the monitor can display (called a Gamut). Nonetheless, the extra colour depth in an image is very useful when processing them, since astro-images generally require us to identify and enhance tiny differences in colour and brightness. So the image you have worked so hard to create is just a bunch of numbers in your computer, and as we'll see the histogram is an important tool for understanding those numbers. The full range of potential ADU values is plotted along the horizontal axis of the chart. In the above example you can see that we have values ranging from 0 (black) on the left to 65,355 (white) on the right. If you were paying attention earlier, you'll realise this histogram is from a 16 bit monochrome image. The number of pixels in the image which have a given ADU value is plotted on the vertical axis. You can see that the scale ranges from zero to 250,000 pixels. There are actually 786,432 pixels in my sample image, but the vertical axis will usually show a smaller scale based on the highest 'peak' in the histogram since we don't need to see all the blank space at the top of the chart. Note: In this simple example I've mocked up the histogram using 21 ADU values at intervals between 10 and 65,535. In a real histogram there would be a bar for each ADU value. I have used a small number of points so I can show you what is going on more easily. A single chart showing just the 'brightness' (Luminance) of the image, which is a sort of average of the red, green and blue values for each pixel. We'll stick with out monochrome example for now, but we will take a look at areal example of a colour histogram later on. On the left hand side there are no data points with values of zero. Even a completely 'black' pixel should have a value which is slightly more than zero due to the way the camera electronics work. The camera creates small random fluctuations to the ADU values of each pixel called Readout Noise which makes it uncertain exactly where the 'black' is in your image. Note: If you are imaging in light-polluted skies, the sky background won't be particularly dark, especially on a long exposure. The main histogram peak will be further to the right the brighter your sky and the longer the exposure, since the large number of background pixels will have higher ADU values than for a dark sky or a shorter exposure. 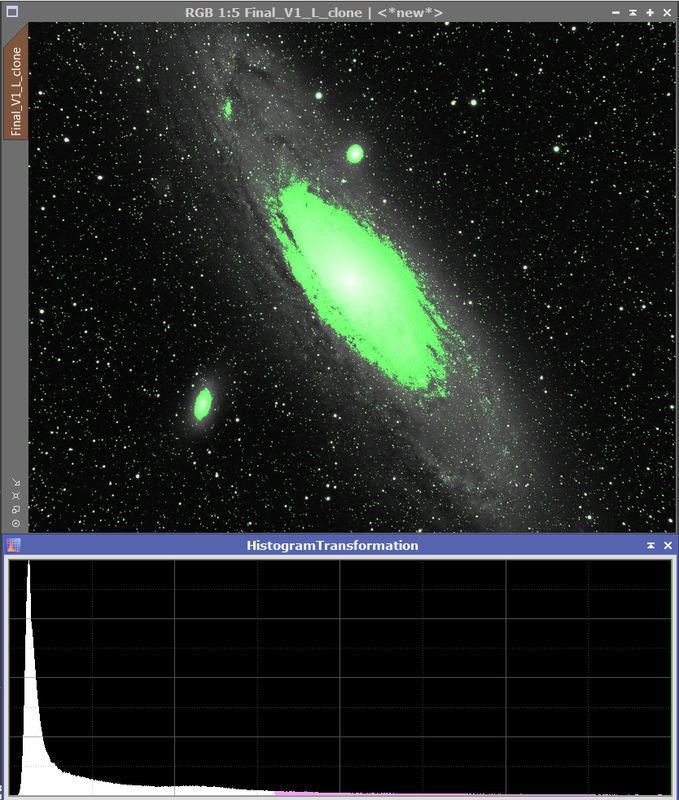 As we move towards the right-hand side of the peak, more and more of the pixels will be from the nebulosity, galaxy arms and the other faint, fuzzy objects that you are trying so hard to capture. That said, there is no hard 'line' where the background sky stops and the 'interesting' stuff starts. The most useful information will usually appear in the very right hand side of the peak and the first part of the 'tail'. This makes it hard to tease out the fine detail in a deep sky image. 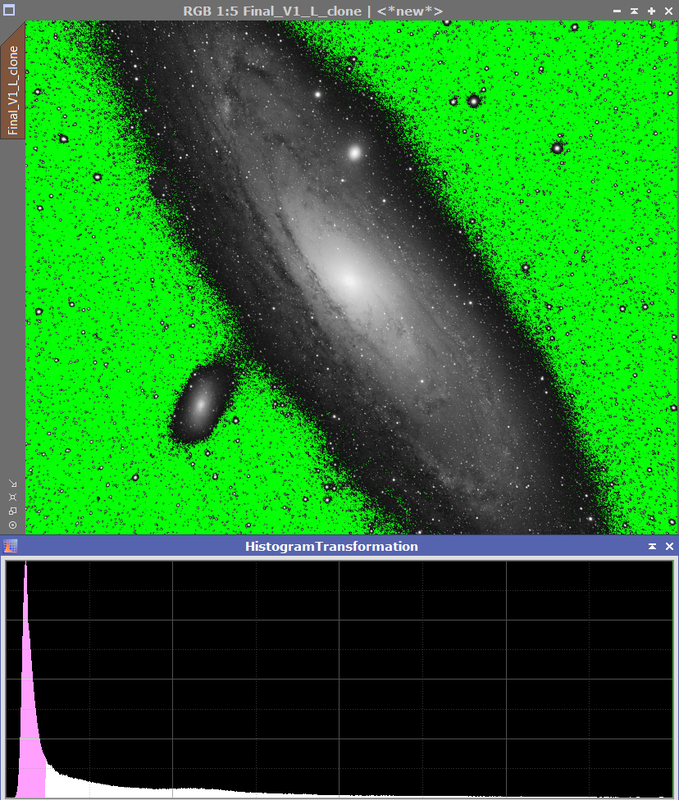 Finally we have a long, flat tail running off towards the right side of the histogram. These are mostly the pixels from the stars in your image, perhaps mixed in with the brighter parts of your target (e.g. the core of a galaxy or the brightest parts of a nebula). Again there is no hard 'line' where the target stops and the stars begin. At the left hand end of the histogram, there may be some 'Cold Pixels' with ADU values of or very near to zero, and at the right hand end there will be a fair few "Hot Pixels" and other anomalies with a very high or even the maximum ADU value. The hot and cold pixels are usually the result of physical defects in the camera sensor. 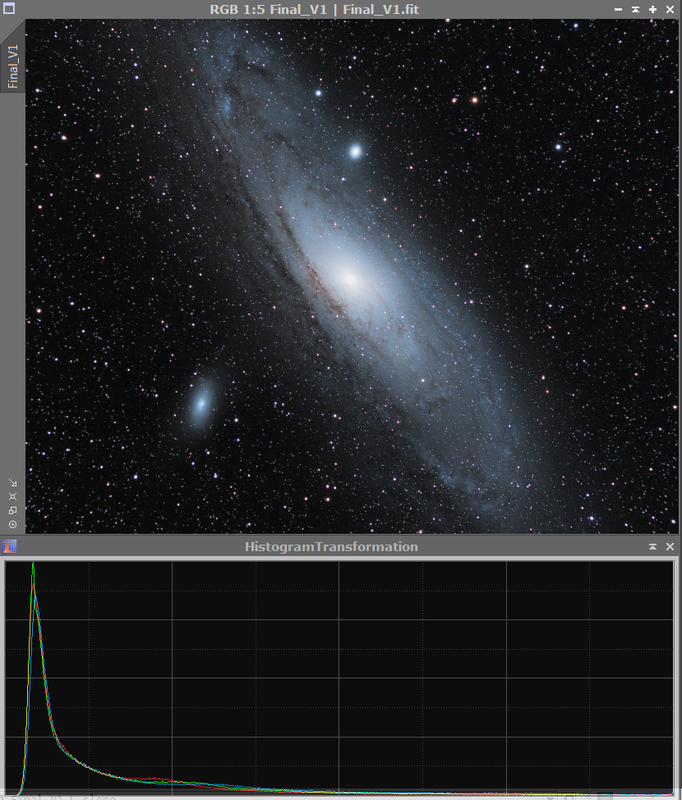 In summary, the histogram tells us about the range of brightness in our image. It is important to note that the histogram contains no spatial information whatsoever. In other words you can't tell which pixels belong to which features in the image by looking at the histogram. For example it doesn't distinguish between pixels that are a particular shade of grey because of light pollution and other pixels of the same shade because they are part of a galaxy arm or nebula. 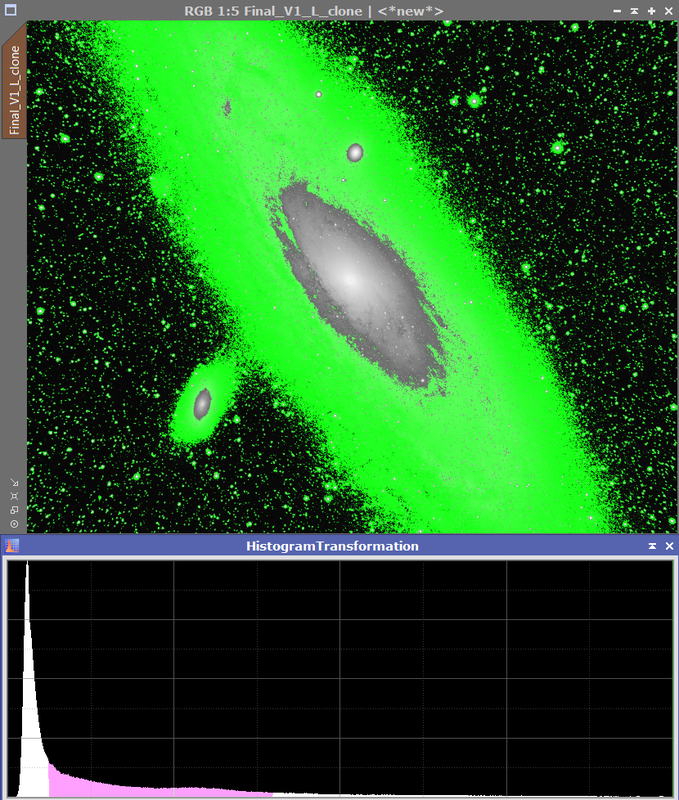 It is usually easier to review your histogram in an external image processing application, so remember to install one on your imaging laptop. Don't wait until the next day, rather you should check your first few exposures straight away and make adjustments to exposure times and camera settings if necessary. It is easier to tell whether you have under-exposed using the on-camera or capture software histogram. As you can see from the example above, the main histogram peak is butting up against the left hand end of the chart. 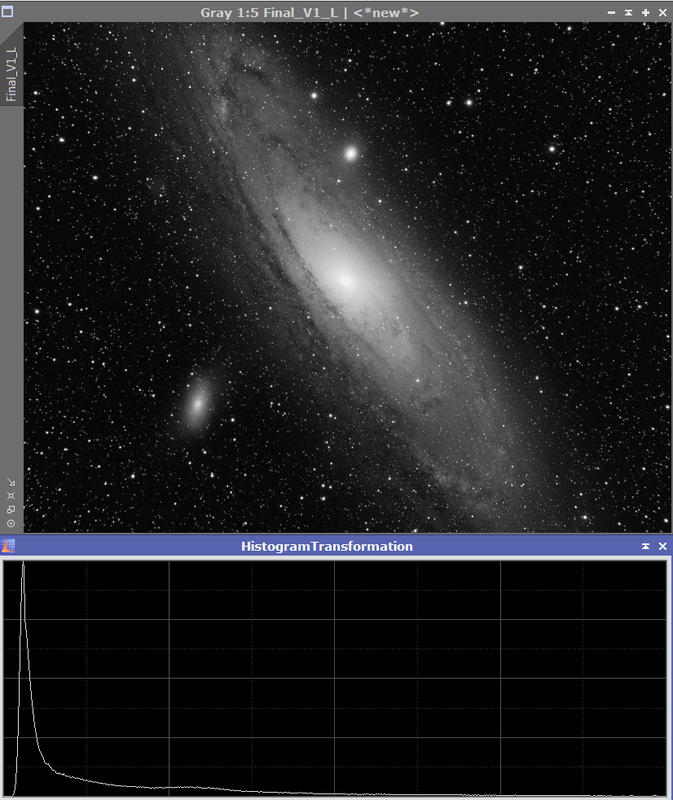 This indicates that many of the background pixels are at or very close to zero where the readout noise has the biggest effect..
Below is an example of a histogram taken from a monochrome image of the Andromeda Galaxy. As you can see, the practice matches up to the theory quite nicely. We have a big peak near the left of the histogram which represents the sky background. This is followed by a 'shoulder' to just to the right which represents the faint outer regions of the galaxy, and a long 'tail' running away to the right, which includes the brighter inner parts of the galaxy and the stars. In my example you can see that the dividing line between the background and the galaxy appears to be well defined with a clear line where the sky 'stops' and the galaxy 'starts'. Don't be fooled though, that is simply because I have already processed this image to bring the faint outer arms of the galaxy out from the sky background. In an unprocessed image, the boundary is much less well-defined. Indeed, much of the art in processing astronomical images is finding that boundary and carefully brightening the target without bringing along all the unwanted noise that lurks in the image.